There are stages of development in which children learn certain skills faster than others. Music is one of them. This phase begins when they are 3 years old and, although it might seem too soon, their brains are equipped to learn the basics while enjoying making music. - For children aged 3, 4 and 5. - A weekly class of 45 minutes. - Maximum 15 students per class. 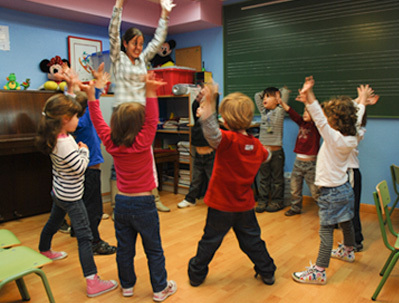 These courses teach the qualities of music (timbre, duration, pitch and intensity of sound) in a very dynamic way that includes musical stories, movement, small percussion instruments, singing, dancing, cards and listenings that should help them educate their ear and rhythm in a progressive way. - For children aged 6. - Maximum 12 students per class. It remains a very dynamic class but in this course, we begin to teach them figures and musical sounds whilst introducing them to the different families of instruments through a series of listenings, so they can begin to study an instrument individually. - For children aged 7. - 1½ hours a week. - Compulsory instrument with a choice of piano, violin, viola, cello, flute, saxophone, clarinet and guitar. It is the preparation of the elementary teachings and therefore requires greater discipline. The first hour involves a group class during which the theory, solfeggio and musical dictation are taught. The last half an hour the student concentrates individually on an instrument.